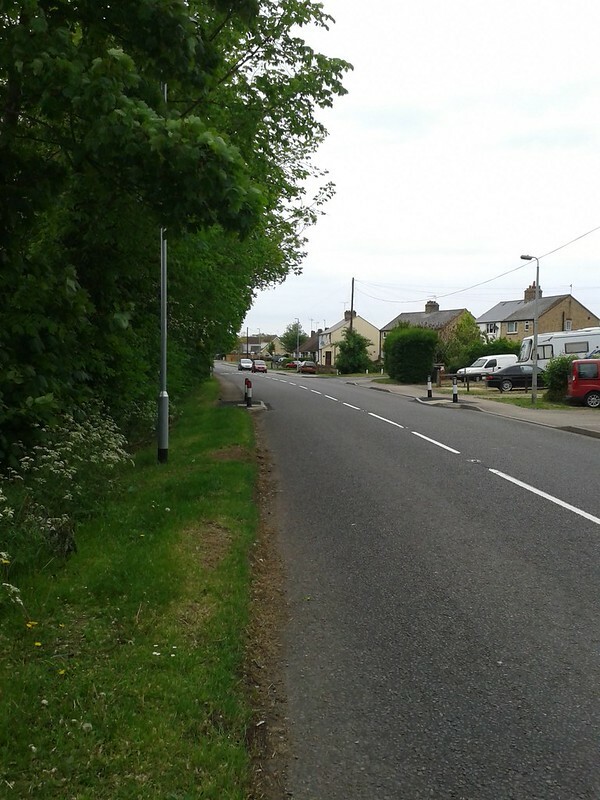 Is the Witchford to Sutton cycleway any good? 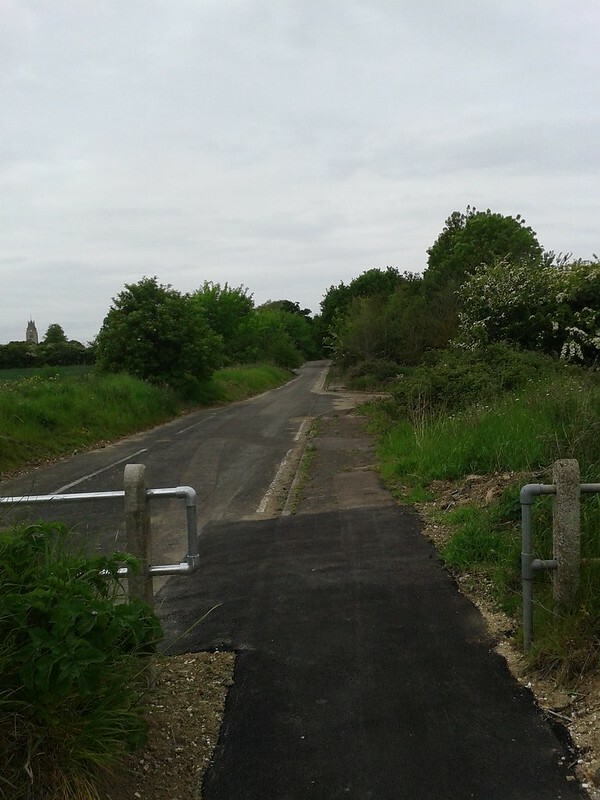 The new Witchford to Sutton cycleway in now finished (except some tidying up around a new street lamp) with a grand opening at 3pm on the 2nd of June . So, is it any good? There is now a complete route. The new section, combined with re-purposed footways and defunct pieces of old carriageway give a complete route from Witchford to Sutton for the first time. Before now, riding between Sutton and Witchford involved either riding on the busy A142 or taking a long detour along narrow country roads. The A142 is a busy A road with fast moving traffic including lots of HGVs. Riding on it was extremely unpleasant bordering on dangerous. 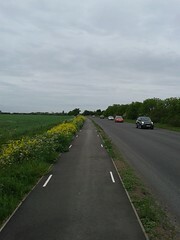 The new route runs alongside the A142 but is segregated from it. No more mixing it with all that heavy traffic. This is a huge improvement. 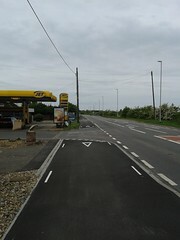 The stretch of the new section along the open road is an adequate width to allow bikes to pass each other or pedestrians. It’s not as wide as we’d really like but given the available space, the county engineers have attempted to make it as wide as possible. All of the new section has a nice smooth surface to ride along. This might seems like something to take for granted, but it’s not (see later re: the lead-in footway sections). It also doesn’t have big drops at the places where it is crossed by field and driveway entrances. The whole route is segregated from the traffic and most of it has a verge between the traffic and cycleway. The verge isn’t as wide as we’d ideally like but again there are space restrictions. Despite being narrow the verge makes a difference, the sections with it feel safer and have less debris thrown up from the carriageway as the traffic is further away. The new section of cycleway is connected to Witchford and Sutton using existing sections of footway. As far as we understand, this was mainly to stay within budget. The footway sections are far too narrow, it is not possible for 2 bikes to pass or for bikes to pass pedestrians, remember this is supposed to be a 2-way cycle route. The footway sections also have terrible surfaces. Riding along the section at the Sutton end any faster than “extremely sedate” risks losing fillings. The section at the Witchford end has large cracks in the surface, one in particular is wide enough to swallow a bike tyre. Both of these footway sections have ample space to be made at least as wide as the new section, if not wider. We’ll obviously now be pressing for these sections to be upgraded to at least the same standard as the new section. There are several elements of the new work which are not as good as we’d like, some of which we raised with the county during the consultation, some of which we weren’t consulted on. We asked for the cycleway to have priority over both of the side roads, and all the entrances to the private properties along its length. We were overruled on the side road priority by the road safety assessment. This is a national issue and it seems that until the national guidance changes it’s going to be very difficult to to get priority at side roads. 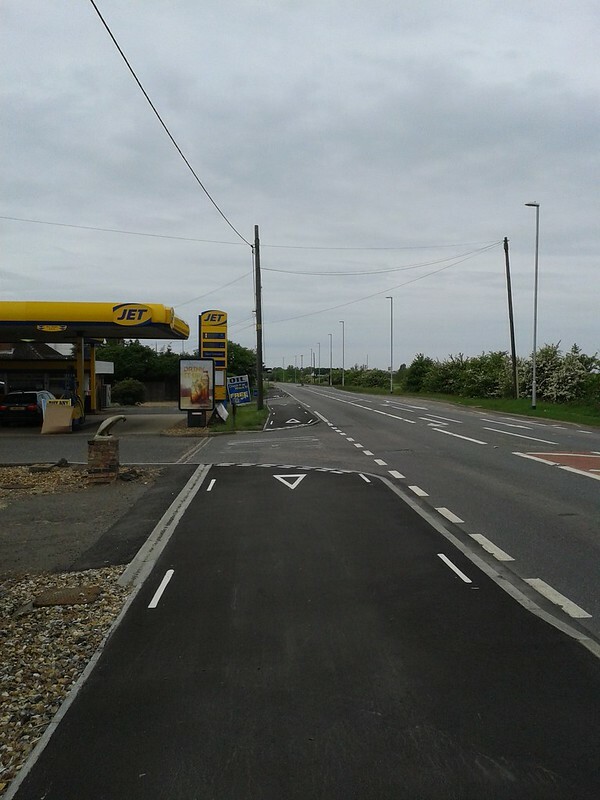 For this scheme there are only 2 side roads and the engineers have altered both to mitigate the lack of priority to a certain extent. The cycleway has priority over all the entrances to private property except the entrance to the filling station. Again we asked for the cycleway to have priority here and we’re not sure why it doesn’t. We’ll be chasing this up obviously. To add to this, the kerbs aren’t flush with the level of the cycleway and give quite a jolt (enough to dislodge a rear LED light) if you cross them at speed. 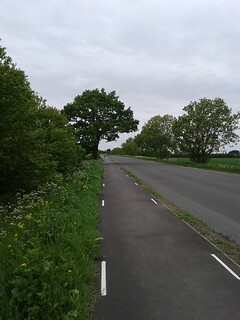 In Witcham Toll the route has a sharp S bend to avoid a telegraph pole and a road sign. The telegraph pole carried power lines when the route was designed. While the cycle route was under construction the power lines were buried (we’re not certain if this was a coincidence). The pole now only carries telephone cables and so should be relatively easy and inexpensive to move, so we’re not sure why it hasn’t been. It’s also not obvious why the road sign hasn’t been moved either. Moving the telegraph pole and road sign would smooth out the tight S bend in the route. 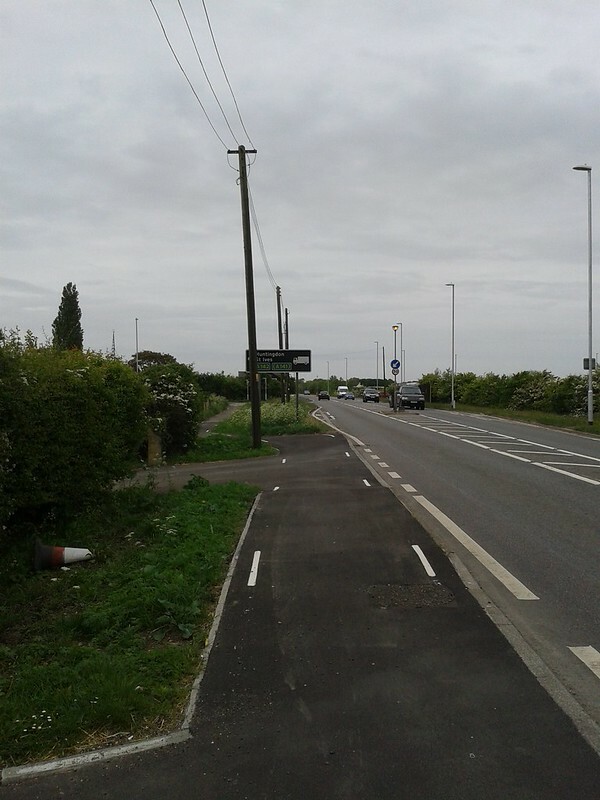 At the Sutton end the route uses the old road avoiding the roundabout on the A142. We weren’t consulted on this section and there are several issues with it. The Witcham Toll end has a gap in the barrier which is only wide enough for a single bike, again remember this is a 2-way route. This gap leads onto the old footway and just past it the route has a sharp left turn and drops on to the old carriageway. We would have suggested a different approach here and we’ll be looking for it to be improved. The old road has a large pile of earth half way along it. 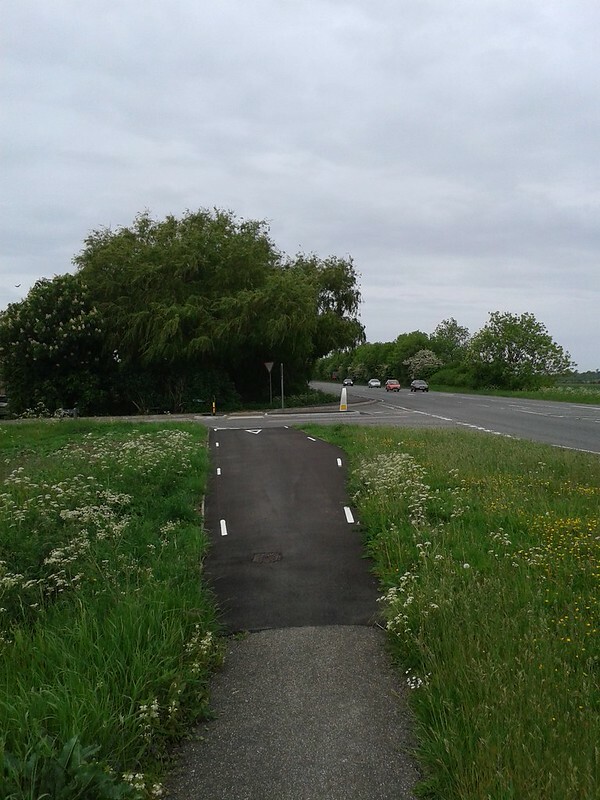 To open up the cycle route a gap has been dug through but the gap is only wide enough for a single bike creating another single file point on this 2-way route. The Sutton end of this section is similar to the Witcham Toll end. We would have asked for a much better design here, but we weren’t consulted. The 2 villages at either end of this route have no cycle infrastructure through them at all. In Witchford this is annoying but as it’s a relatively quiet village with a bypass it’s not terrible. In Sutton however the road is busy with lots of traffic including large HGVs. It is great that there is now a ridable route between Witchford and Sutton. The newly built section is as wide as it can be, smooth and pleasant to ride along. It’s not perfect but its deficiencies are relatively minor and can hopefully be ironed out. The major issues with the route as a whole are on sections which haven’t yet been properly tackled. We’re hoping these sections can be upgraded soon. There’s a full set of pictures of the new route on Flickr here. ‘mylocat’ : I understand that there is a cycle path alongside this road, so what was he doing on the road? ‘Annoyed from Northampton’ : A gentleman of 70, probably didn’t realise that there was a cycle lanes, as the older generation are usually more law abiding than the younger generation. SAD, R.I.P. Can you publish the reasoning from the safety audit and challenge them to point to the guidance forbidding priority? I suspect it’s been replaced. Also, please report the cracks on http://www.fixmystreet.com then any people whose bikes are damaged can see that the highway authority knew and had failed to respond, so claim for the damages. Finally, those non priority junctions are lethal. See the recent report about a death in Richmond on the LCC website, for example. No safety audit should be requiring them, surely? East Cambs or Cambs County should really start a regular maintenance program for these expensive paths which otherwise become useless before they are even officially opened! Highways must make sure they keep intrusive branches, etc trimmed (this might even apply to some stray crops on the field side of the track). 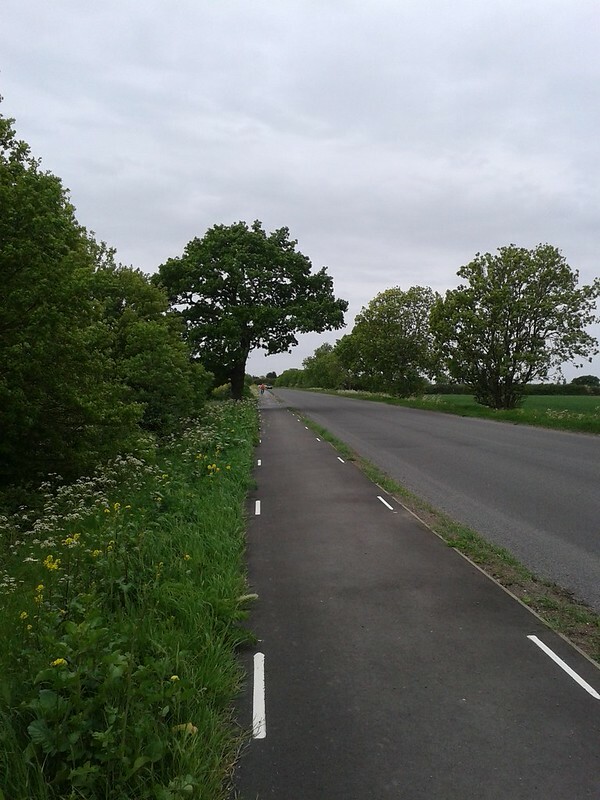 An overhanging branch isn’t just a nuisance, it can cause a cyclist to deviate dangerously, possibly into the road at points where there is not much verge. At night, or with a cyclist coming from the opposite direction this can be particularly dangerous. This junction box for the street lamp needs to be moved back onto the grass verge. 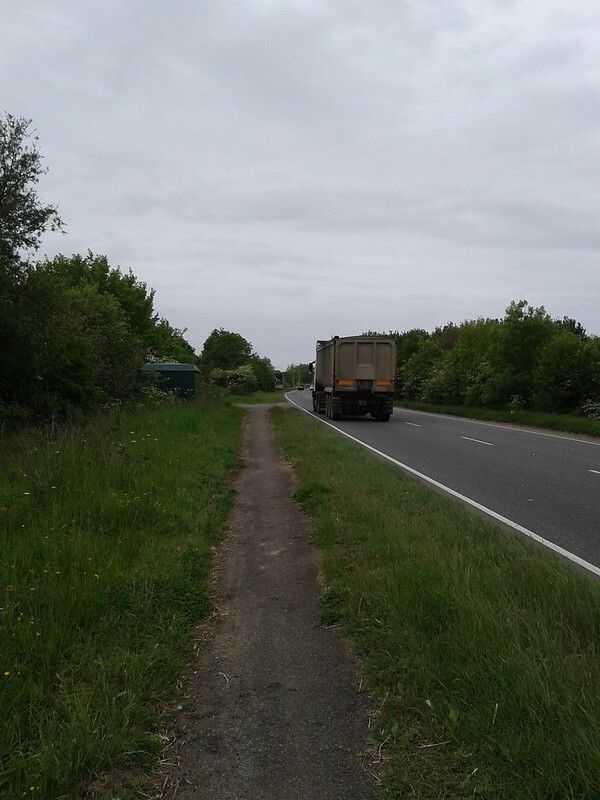 We have heard that the sections of the route at the Sutton and Witchford ends are being considered for upgrade but we haven’t been given any further details. Try contacting your local County Councillors – Bill Hunt and Lorna Dupre.